The Banner MasterTM brackets are made for long term banner installations and perfect for displaying banners on outdoor light poles. Manufactured with heavy aluminum plates and fiberglass arms, these brackets have been jet engine tested to withstand winds up to 77 mph. Designed to flex with heavy wind loads, Banner Master's arms adjust up and down, leading to easier maintenance and reduced repair costs for your city, campus, organization, or shopping center banner project. Each bracket set includes all necessary pole banner hardware for installation and is designed to support banners from 24" x 48" up to 30" x 96." The Banner Master includes easy-to-use features including the ability to remove the arms when not in use and the brackets can easily adjust up and down up to 2.5" for quick maintenance and banner changing. If you are tired of replacing your banner brackets or want more durable brackets that will last for years, Banner Master brackets are your answer. 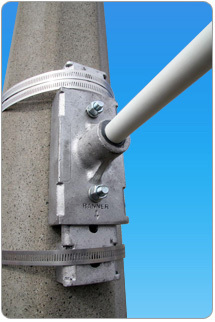 Stainless steel bands are included with the Banner Master bracket system. These light pole brackets are in-stock and are usually ready to ship within 24 hours of purchase from Zane Williams.